Findings from NotJustPartz. 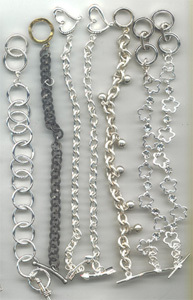 Chain by the Foot, Bracelets, Necklaces, Chokers, Memory Wire, Wings, Metal Coil. 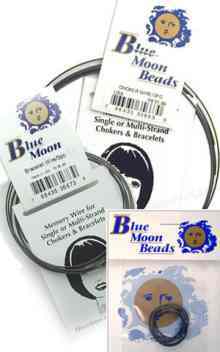 Blue Moon Memory Wire makes stringing easier. Just slide on beads and charms, and loop the ends..
Just came into some closeout memory wire, ring size, cuff size and necklace/choker size. Still in package from Blue Moon, never used. Great Condition. Usually, $1.99 each, I have had them at 50% off, but i'm putting them on special.... 3 Packages (one of each, or 3 of one) are $2.75. 6 packages go for $5.75. (some packages have 3 rings in them, some have one continuous multi loop ring.. same with necklaces and bracelets. 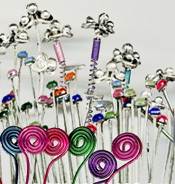 Fancy Headpins to Make Your Jewelry Special! We'd like everyone to get a chance to try all of the headpins (there are 3 other styles in odd quantities i decided not to list... but they are really nice. I will add them in these mixes.) Assorted only!! 24 for $6.50; 48 for $12.50. 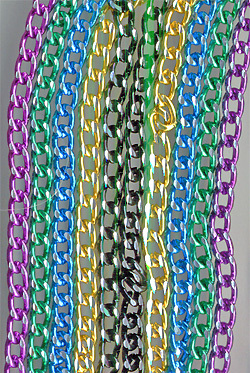 Anodized Aluminum Chain is a real wonderful addition to any project. Lightweight and great for earrings, tassels and decorations, this diamond cut chain in bright colors is wonderful to behold. The color is anodized, so it won't wash off, scratch off or wear off. However, it is aluminum, so don't use it where strength is needed. 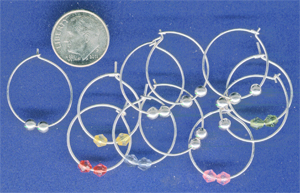 We've got about a gross of wine charm loops, most have 2 silver balls that go on either side of the charm, 12 have small faceted beads. They're brand new, untouched and ready for you to load up with your favorite set of charms. Black Enamel Wire Choker (click for photo) Black enamel wire chokers with wonderful slim magnetic clasps make any charm or head a quick and lovely pendant. Great stuff. Transforms any necklace into an attention-getting "what is THAT?" 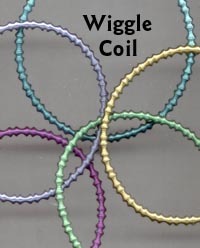 by using short lengths of coil as spacers or looping it around chain. Great for memory wire projects. 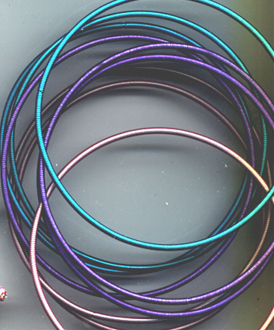 Made of steel spring wire and tinted in fabulous pastel shades. We get assorted, you get assorted. They're pretty indestructible, don't crush easily and cut well with wire cutters. 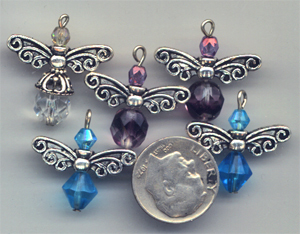 Add graceful victorian-type wings to any 2 beads and voila! instant Butterfly! 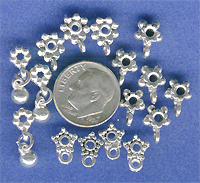 Well made pewter "wings" have vertical hole and a nice curved bottom and top to accommodate most sizes of beads. Delightful for parties! The stretch cord is a reassuring 1mm and the cast spacers give these bracelets a good heft. Sized for most adults and some for even kids to wear. They can be worn as a bunch on one arm for fun, or taken apart and used in craft and beading projects. Great for party favors, cheep enough for kids parties! MULTICOLOR: Bright acrylic beads, some faceted, some smooth mix with plastic silver round beads and rhodium-plated cast metal spacers. 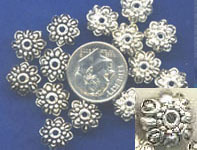 SILVERTONE: Plastic silver round beads, some smooth, some etched with flower patterns with rhodium-plated cast metal spacers. 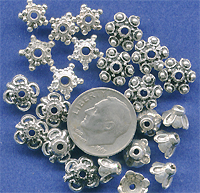 Base metal bead caps, spacers and spacers with bails with an antique pewter style finish. Bagged per dozen. Medium sized caps for 5-7mm beads. Bead caps vary slightly in depth of finish, but the caps are bagged for consistency. 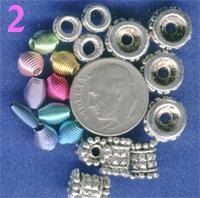 Bead caps for 4-6mm beads. Bead caps vary slightly in depth of finish, but the caps are bagged for consistency. Bead caps for 6-8 mm beads. Both bead caps are the same style, but differ in depth of finish. 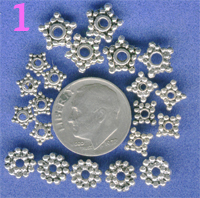 Three filigree-style bead caps. Each cap has openwork, which shows the bead off! From left: Open weave, Filigree dome, Loopy rosette. Four nicely detailed bead caps. Two are in the bali tradition, the other two have a floral motif. From top right: Bali Star, Bali dome, Deep Tulip, Loopy Daisy. 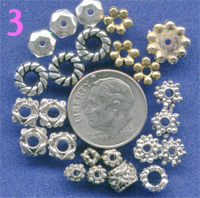 Four type of spacers with bails for hanging charms. 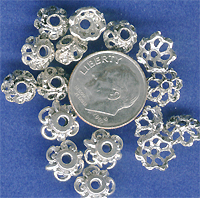 BASE METAL SPACERS OF ALL SIZES. 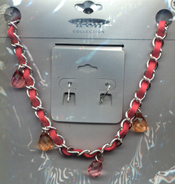 Carded Necklace and Earwire set.... still in package! 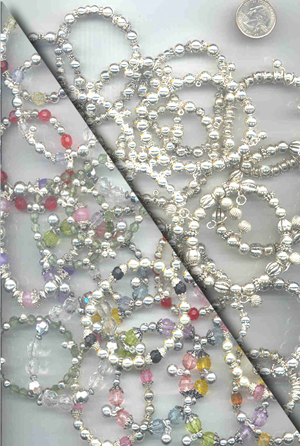 Give your own charm jewelry a professional look with necklace chain and earwire sets, already carded and bagged. $2 per set. Necklace/earwire set detail. THE APP FOR ALL YOUR BEADING TROUBLES. Tubular metal spring bracelets. Probably the most useful (and hard to find) accessory I ever came across. Click here for more.